So Charlie lives on this historic old sprawling farm in Maryland, with three generations of the family still living on site. It's primarily been an eventing farm, hosting recognized and unrecognized events. Each generation of the family has competed (or currently is) at the upper levels and trained with top pros, dating to the Jack Le Goff heydays. But the farm's biggest claim to fame, imho?? The SHETLANDS OMG. The farm has been breeding them for ages, and is literally crawling with the shaggy little beasties. I'm legit convinced that nobody could tell you exactly how many there even are haha. Every little nook and cranny has some Shetlands tucked away in it. From what I can tell, a lot of them are broke to drive, and many are used in the lesson program. Plus a select few do the Shetland Pony Races at major venues (like at Devon, below!). But ya know. Most of them are just shaggy little beasties living their best lives out in the fields. As you might imagine, Charlie is intensely jealous of them and desperately wishes he could be a shetland too!! honestly it's amazing i still have ten fingers where there are so many cute noses to pet!! It's not uncommon to see some of them loose, wandering the farm, too. Like the wonderful little farm matriarch, Whoopie. That ancient sweet mare basically has the run of the place, and can often be found on the back pathways minding her own business grazing on the lawn. they have the most intense hair!!! The other day tho, I got to live out that girlhood fantasy that I'm sure we've all had at one point or another: That total "black stallion" moment. You know the one, where there's a wild horse running free and you're the only one who can catch him and tame him, and form this magical unbreakable bond forever and ever. Right?!? Lol...... Or, more realistically, just one of the naughty little ponies (Upperco, to be precise) escaped from his new pasture and was raising hell getting into everything in the barn lol. Luckily a handful of grain later and I was walking him over to the big house to be identified and returned to his proper place. From which .... naturally.... he escaped again moments later when the evening feeder turned her back on him for one second lol. Rotten ponies! it's not hard to pretend we're out in some mystical wilderness. can't you just imagine the unicorn horn?! You better believe tho that I gave the whole "Finders Keepers" thing my best shot tho lol. Like, c'mon, "you become responsible, forever, for what you have tamed," right???? Unfortunately the farm owner didn't see things my way and I did not get to keep my newfound pony.... Oh well! That's ok tho. I can still get my fix lol! 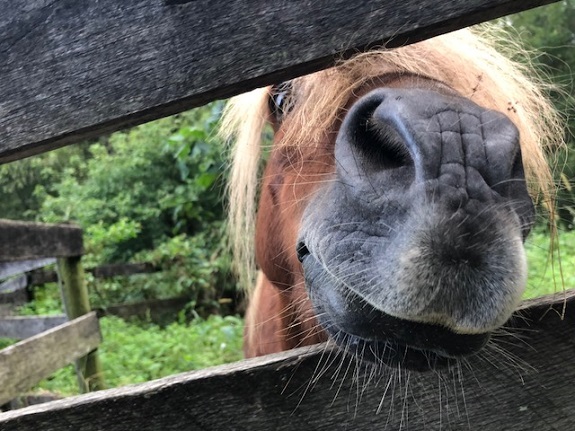 Like there's a little pasture on the walk down to Charlie's ancient bank barn that has always housed the two little Shetland stallions on the farm. This past winter tho, they renovated the nearby outbuildings and the studs had to be relocated. These two little hell raisers are maybe my favorite residents on the farm. I mean. First off, they have epic hair. his hair tho. omg his hair. look at that mane!!! and he's soooooooo dirty in the rain!! yes they have run in sheds, but no they most certainly don't care when there's so much mud to play and roll around in! Secondly, they're always getting up to something. Usually teasing the small children who are always wandering up and down the driveway haha. I think the brown one is my favorite bc he makes these amazing little whuffle-y noises when you walk up to him. He's the beta of this dynamic duo, so he's always trying to get your attention but quietly enough so that the alpha black stallion doesn't hear him too haha. They're both just so seriously cute tho, lol. And like.... After working all day, then driving 45min through rush hour highway traffic, it's the absolute perfect antidote to step out of my car and be immediately greeted by these two amazing little Shetlands haha. Just another reason why the farm is such a special place to be haha. Bc who doesn't love being surrounded by little ponies?!? On one hand, I am often a little frustrated at not getting to school cross country as much as I'd like. There's always a reason, ya know? Ground too hard. Ground too soft. Scheduling conflicts. General yellow-bellied pansy-ness. You know how it goes. Excuses, excuses. On the other hand, tho, in retrospect Charlie and I have actually gotten out a fair amount this year. Not as much as I'd like, but then again Charlie doesn't seem to need as much as I do in terms of repetition and regularity. So for his purposes, he's had a pretty good year of schooling. We had our first outing of the year back in January, schooling the all-weather courses at Loch Moy. 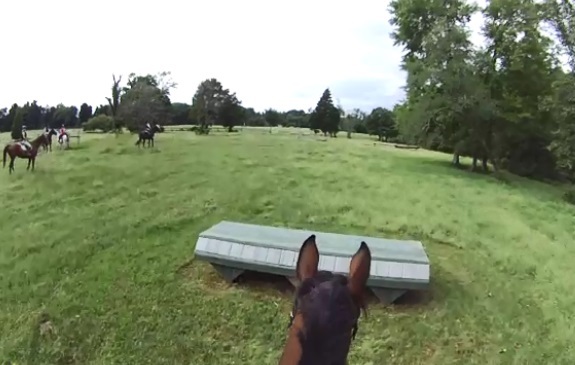 It was his first time seeing solid jumps since his surgery, and he easily rocked around the full BN course (in pieces tho, bc we were a little too wild to put it all together for the actual derby round). Then we made it out in March to school at home for the first time all year on impressively good ground. This was... a very special day for me. Hard to explain why, but Charlie was excellent. We stuck to BN fences, but still found a few to add to our repertoire that had previously been a bit intimidating to me. Like a big log with a drop landing, and a substantial log table thingy. 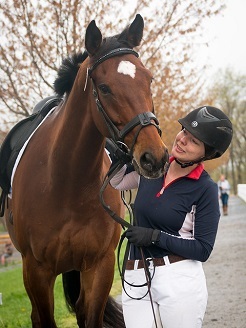 Then in May, Brita and I headed out to Shawan Downs after their recognized HT to school the competition courses. I had walked the N course ahead of time (after finishing up my volunteer shift at the HT) and was determined: we would start laying the ground work for moving up. And? Charlie could not have been better. We only skipped the smaller early fences on course, but jumped all the important stuff. Including some of the biggest jumps he'd ever seen before (like the green table at the end of this post) and he never blinked - even despite some of my standard bobbles, mistakes, and under-riding. There was a lull in our schooling sessions for a little bit while we were out actually, ya know, competing. 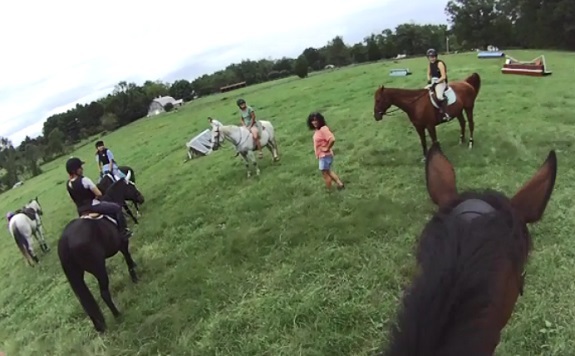 But we got back to it in July for a laid back schooling session at home. 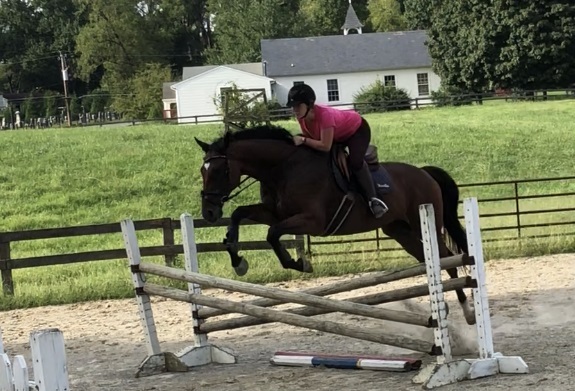 This was Charlie's first schooling since our disastrous Plantation outing, and I had to be a little more focused on puffing him up vs just getting out and jumping all the things. He was good tho, and happily tackled a mixture of BN and N jumps (and the deep dark scary T ditch!! ), and his only struggles with the N line of roll tops were very honest issues -- leading to my decision to get him drilled and tapped for studs. Later in July, we did a pace clinic at Loch Moy that focused more on learning speeds across a 1,000m track than anything else, but we still stuck around after to jump one or two things. I honestly credit that pace clinic - and it's obvious focus on riding forward - with helping Charlie get his mojo back. 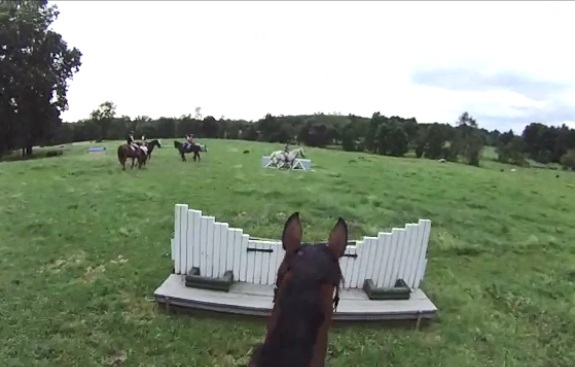 Then just a week or two later, we headed out to Boyd Martin's legendary Windurra for another fun schooling ride. The ride unfortunately began with a very unexpected ditch issue with my decidedly not ditchy horse, which blew through a lot of Charlie's emotional capital before we even really got started. Not ideal.... It was still a good ride tho. We got a little more practice with tricky terrain and more technically styled jumps (corners and skinnies) while mostly sticking to conservative N and BN sized fences. 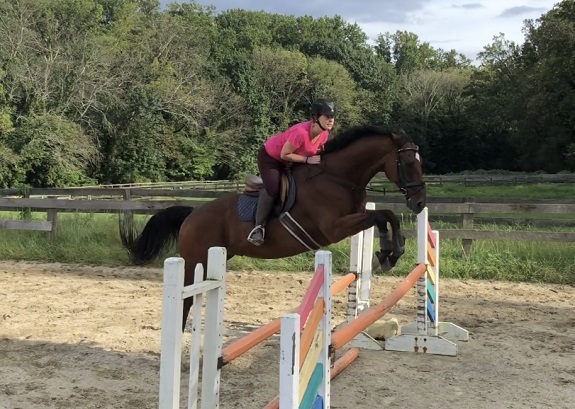 Finally, our last schooling was during the Labor Day hunter pace at Tranquility, where we mostly played around but tackled a few N jumps all the same. Obvi nothing garnered a look from Charlie and it was all just for fun. these chevrons have always been intimidating to me. they took charlie by surprise too but he gave it a good honest effort! So ya know. We've had some good solid outings this year, and combined with Charlie's competition runs (BN at Loch Moy this past spring, then N at Loch Moy, Plantation, Jenny Camp, and then Loch Moy again for their twilight event, where we also added in a massive T table!) it feels like Charlie's pretttttty damn schooled to all things BN and N at this point. Also worth noting: despite our best efforts and intentions, we've also been without coaching for all of the above, with the exception of trainer P warming me up for xc at Plantation. To me, this is decidedly not ideal. Like, sure, Charlie's doing just fine. I'm 100% confident that there's nothing at N or below that Charlie can't face (except maybe down bank combinations bc..... I'm a pansy and really haven't done my homework here like I ought to....). And despite a lack of formal training on cross country with Charlie... I've got literal reams of lesson notes from getting started at these levels with Isabel. Thanks to the blog, I've been able to study study study all those notes from Dan and Trainer P, plus the actual footage from those early lessons. It's helped a lot, and Charlie's benefited directly from that. But the flip side is.... I'm really bad at pushing myself. And really good at rationalizing my way out of new challenges. 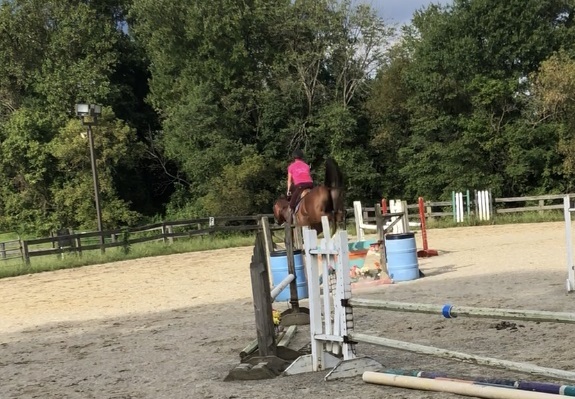 Competitions are weirdly good for me tho, bc if you put a flagged obstacle on my course, then I will be all stoic like "Well I guess that jump is just gonna have to get jumped!" 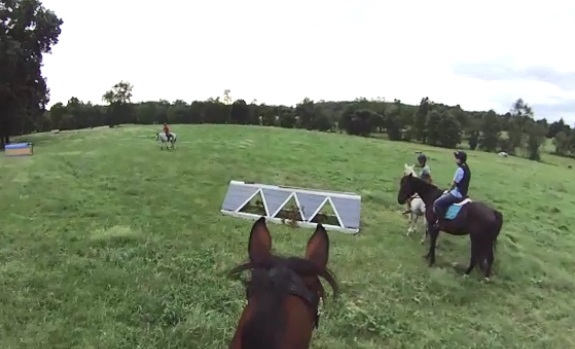 But give me a field full of the same jumps, but now unmarked, and yea. I'll totally just be like, "Eh it looks big tho. Not today." Which is part of why the Shawan schooling was so useful for me. I had walked the course and knew which jumps were N. So even when we got there and they were unmarked, I couldn't talk myself into believing otherwise. I knew what was N, and knew that if I wanted to do the N stuff, that's what I had to jump. So I jumped it. And it was fine. Charlie was fine. And therefore, I was fine. Educational experience! Kinda the same story when we school at home - I know which jumps are which without a shadow of a doubt. And can make choices accordingly. But take me to Windurra and.... yea. I really didn't go for it. When maybe I could have. That's not a bad thing, per se. All experience is good experience for Charlie. Positive easy mileage is always worth it. Like when we did the Twilight at Loch Moy and I opted to not really school any of the T (except for that one haha). It's really great to feel like we're ready for a challenge, to feel like there's more there to push for, even if I'm a little shy about actually doing the pushing haha. But that's what lessons are for, right? That's why it's so great to have a trainer there to dismiss any excuses, while also providing the guidance necessary to be successful with new challenges. seen this before too! funny how this past spring, this table was the biggest thing i'd ever pointed charlie at. and now? it's old hat! Unfortunately I ended up feeling a little disappointed with this particular lesson in that regard. We've had a ton of rain here (I believe record rainfall across the entire year in Maryland) and the ground is just... not good. Therefore we needed to be as judicious and protective of the ground as possible. Meaning: some jumps were entirely out of the question (like the line of N rolltops that Charlie and I have struggled with). And otherwise trainer P wanted minimal repetitions to avoid tearing the ground up. So a couple jumps that we did a little funny (like the line through the water to the red coop) didn't get a second chance to smooth it out. Also we had a bit of mixed group, including some folks who are totally capable but had never schooled xc before. So a lot of time was spent introducing them to the finer points, while Charlie and I felt a little bit like an after thought. 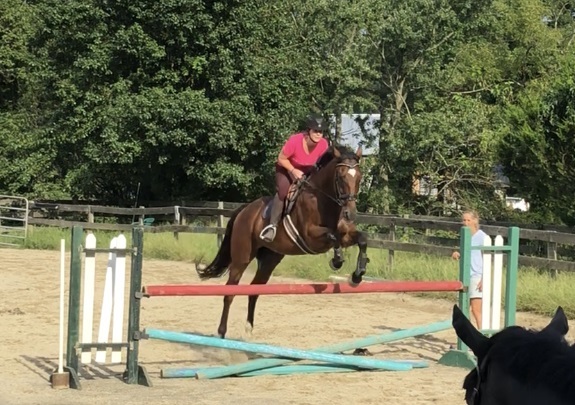 So I ended up having to ask to jump bigger things than what trainer P directed me to - like asking to jump the chevrons and piano jumps (both of which have vaguely haunted me since 2015 haha) instead of doing the same BN jumps that Charlie's jumped a million times. 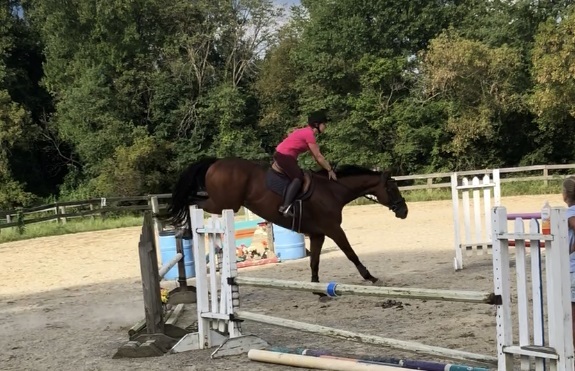 Obvi asking to jump other things is totally fine, and trainer P had no problem with it..... but it kinda undermined the hope for the ride: that I'd get a trainer to push me to go where I hadn't gone before. Like, there are other jumps out there that I want to jump. That I *know* Charlie can do, is maybe hungry to try. But.... time and again, when faced with the opportunity, I wuss out. And even in this ride, even as I'm sitting there *knowing* that I should ask trainer P if we could try them.... I just... didn't. Again. Sigh. So we really only just jumped a handful of things. All of which Charlie's seen a number of times before - with the exception one log at the beginning and the chevrons and piano that I asked to try. It was kinda boring, honestly. Tho let's be real: that's never the worst feeling when schooling haha! 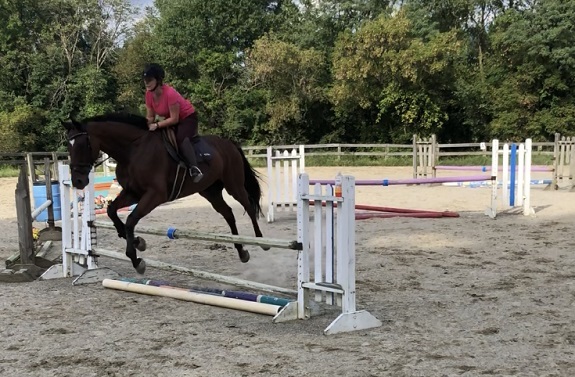 Charlie answered every question, was clever where he needed to be (like when we almost fell down in the deep water but he still locked on to the jump anyway! ), and basically just hopped around like a pro. I'm cool with it. Hopefully tho, at some point it'll stop raining and we'll be able to get back out again sometime soon to try for more. This past weekend I tried out another new volunteer role: scribing at the Future Event Horse East Coast Championships at Loch Moy. Specifically, I was there for the conformation portion (unfortunately was not able to make my schedule work with the free jumping phases! next time!!). I signed up mostly bc it seemed interesting and volunteerism is a big part of my goals this year. Plus Loch Moy is one of my favorite venues for volunteering, so I'm always eager to help out at any of their many events. It seemed like a fantastic opportunity to learn a little more about what judges and breeders are looking for in the next generation of upper level event horses. I've never claimed to be much of a conformation aficionado. In fact, quite the opposite: I'll be the first to admit that my eye for this sort of thing is not particularly well developed. In my humble opinion, many adult amateurs are often too fixated on the ideas of quality, talent and potential, at the expense of other attributes that are maybe more essential to amateur success at the lower levels. Like brain, disposition, temperament, etc. It's not a super popular opinion, as evidenced by the somewhat controversial post I wrote on the subject and some of the subsequent commentary.... But I stand by that opinion. this one had an extremely fancy trot! Regardless, I'm still very interested in continuing my education in this area. To this end, scribing for this event was in fact quite useful. I learned a lot about what factors the judges are looking for in each horse when it comes to type, build, and movement. Tho let's be real: just bc I heard the judges using certain terminology and describing certain aspects of each horse doesn't mean I could similarly identify those same aspects myself haha. Some horses had this sort of obvious "impressiveness" about them that made them stand out from the rest, but even so, most of the distinctions the judges made were well beyond what my own naked eye can immediately see. I'll do my best to recount the details for you anyway, tho. There were four classes: 2 year olds and yearlings, one class each for colts and fillies. Judges used the same test sheet for both age groups, tho obviously there's a pretty big difference in build from a yearling to a two year old. Many of the 2yos were already quite well built, whereas the yearlings were presented in all variations of growth spurts. Comes with the territory tho! And it's worth noting: while many of the yearlings were in awkward growth stages, changeable attributes like being croup high did not appear to impact overall scoring at all. Rather, it was the fixed elements of conformation (angles and such) that judges focused on. Each handler began their presentation by bringing the horses to the "triangle" (visible in the background above) and standing the horses up for a preliminary inspection by the two judges. Once the judges felt like they'd seen enough, the handlers walked the horses out to that yellow flower box visible in the mid left edge of the above picture, then walked across that middle ground line of poles, finally walking straight back to the judges. 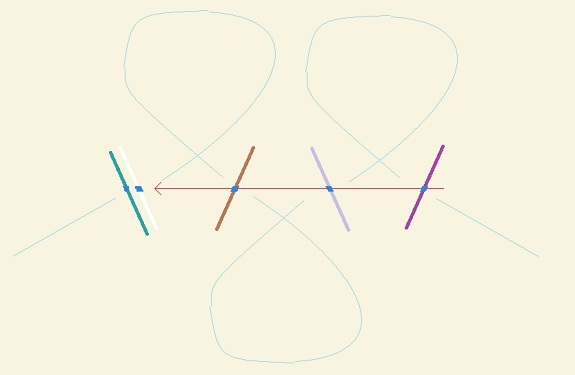 They then repeated the same circuit - except at trot and going all the way to the far back edge of the triangle above instead of cutting across the middle. Then the handlers stood the horses up one last time for the judges to finalize their impressions before returning to the tent to confer. The two judges discussed each horse at length, and talked through any disagreements to ensure their scores weren't wildly off base from each other. But ultimately each arrived at his own individual commentary and scores. Thus each judge had his own scribe and each horse received two test sheets at the end of the day. pictures with the judges and competitors after the class was pinned! The first part of the score sheet was all about Type. Specifically, the presence of "refining blood." I took this to understand the desire to continue introducing more thoroughbred blood into the bloodlines. Judges wanted to see horses with a lighter build, more refined (vs coarse) connection points through the body. 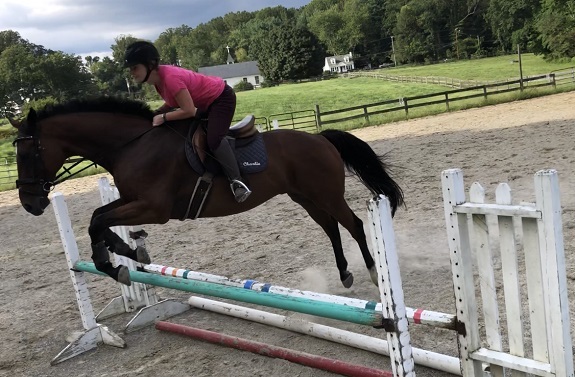 As opposed to the thicker, heavier warmblood build that is often less quick over the ground or able to hold up to the rigors of upper level eventing. Next block on the test sheet was Conformation: Frame, wherein the judges wanted to see fluid toplines, smooth connecting points in the body, a nice head and neck, and a general overall proportionate build. In this section they'd review areas like how the neck ties in to the body, or the shoulder angle, for instance. obvi there's a big difference between yearlings and 2yos but.... still. wow. It's notable that while some horses received comments along the lines of "under developed" neck or topline, the judges were actually pretty ok with this especially among the yearlings. With the idea being that a yearling with a big thick well developed neck is probably going to continue to thicken and grow heavier as it ages. Thus sorta negating that desire for the more refined overall build. i was impressed with how quickly the judges could isolate the strengths and weaknesses with each horse! Next portion on the test sheet was Conformation: Legs and Feet. This would be the area where I know the absolute least haha. Full disclosure. But this was actually often the sticking point for many of the horses. Particularly, I often heard the judges say quietly to each other (absolutely not to the competitors, obvi), "lovely horse but you couldn't buy that forelimb." The most common defect observed by the judges was not enough bone below the knees. I guess this issue comes hand in hand with breeding for a lighter and lighter, more refined horse. The lighter build often comes at the expense of lighter limbs. But the judges still wanted to see strong bone through the cannons (not too long! ), correct pasterns and angles, and good quality feet. The judges were also quick to identify any conformation flaws like being over or behind at the knee, or just a bit "flat" kneed (many examples were had through the classes). They also identified feet they found too boxy and would include on the commentary advice for handlers to keep an eye out for any one limb that looked suspect. sure isn't much there not to like, eh? It was interesting tho, bc even some of the most nicely built horses with the nicest movement lost out big time (sometimes with leg/feet scores close to 2 points lower than the rest!) bc of flaws in the lower forelimbs. And the judges kept coming back to "But you wouldn't buy that leg." Bc again, this is all about developing talent and models for the upper level of the sport. And at the upper levels.... conformation flaws can often mean breakdowns. Anyway, next on the sheet comes Movement, with individual scores (and different coefficients) for the Walk and Trot. Walk has a higher coefficient bc it's also the gait that tells you more about how the horse might canter or gallop. This is always so important for me personally to remember bc I fully admit to being suckered in by a pretty trot. But.... The trot alone ain't enough for a winning event horse. As evidenced by the fanciest trotting horse we saw all day actually ending up scoring the worst over all in his class, oops! For the walk, they wanted to see a very fluid, natural "throughness" in the horse that presented as good overstep and relaxed oscillation in the neck. They wanted "march" in the steps too, placing each hoof with purpose rather than kinda just plodding along. In the trot they wanted to see engagement and hind end activity, combined with good reach through the shoulder. Tho it was my impression that the hind end activity was the priority here. 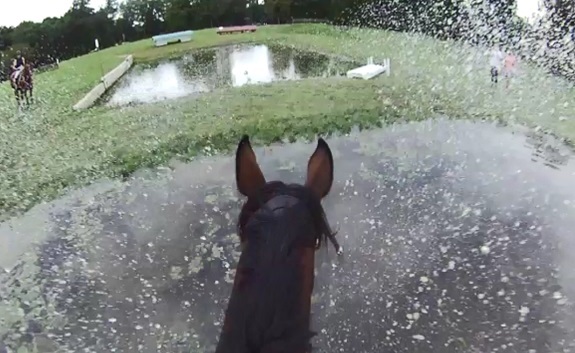 Funnily enough, tho, in some ways the puddles worked to the handlers' advantage since a lot of the baby horses were especially active through the muck haha. For both gaits, tho, a correct rhythm was a must. And while obviously it's tough to ask baby horses to not have tension in this sort of setting, they really wanted to see those moments when the horse would really be loose and soft over their backs. I thought it was cool tho how forgiving the judges were of all the baby horse shenanigans. There was zero commentary, actually, on presentation in terms of grooming or tack. And while one handler went a bit off course in her presentation on the triangle, quite a few got dragged wayyyyyy off their lines, and almost all experienced breaking gaits at some point or another, the judges really didn't seem to mind at all. They just went wherever they had to go to get a good look at the horses. And if they felt like they needed to see more walk or trot, they just asked the handler to do another circuit. Nbd, and no impact on scoring. unrelated: loch moy always has a collection of shoes found on the xc course, many of which still have the studs attached. i'm always fascinated by the different shapes, sizes, types, and materials! Tho they did often observe on the quality of handling we saw at this event: saying that all the horses seemed very well presented. Which makes sense since a lot of the pros in these classes have specifically carved out their niches in the horse world by focusing on developing young talent. So... ya know.... this is basically what they do haha. Anyway, last score on the test sheet was General Impression, which also had a high coefficient. The judges would often provide commentary on the "whole package" of the horse, like the above comment "Athletic prospect with conformation to match." And this is basically the score that kinda separates the "would buy" horses from the... rest haha. Personally I probably would have taken literally any of these horses home lol. A few in particular just had such sweet eyes and expressions! But. Ya know. Maybe in another lifetime! All the same it was really cool to get to see such amazing young horses and listen to the judges converse about the ideal "model" horse for the future of eventing. From a volunteer perspective, it was a pretty easy gig. If you like scribing and don't mind being on your feet while doing so, it's totally worth your time! Think you'd ever sign up for something like this? Or maybe attend some sort of clinic or educational program focused on this topic? Is conformation something you're really passionate about? Or are you more like me, kinda fuzzy on the finer details but think it's interesting from an academic perspective? Or maybe you have a young horse and see these types of classes in your future? Or have already participated and have a different perspective to offer? Over the last two years, I feel like I've learned a lot about what Charlie needs in his regular routine to make him feel good and perform well. And like any horse, a varied approach seems to work best for him. We do lots and lots of relaxed hacking and exploring over mixed terrain. It's refreshing for both the mind and body, after all, and a critical aspect of Charlie's overall physical conditioning program. But I learned the hard way after Plantation that all that hacking out and conditioning can't be done at the expense of targeted focused schooling rides. 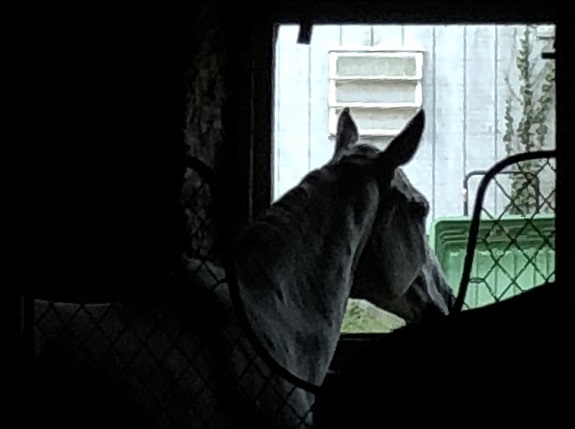 Even the best horses can have off days, and without the practice of disciplined schooling we risk having everything fall apart when the pressure is on. My ideal end goal for every single schooling session with Charlie is that he finishes the ride strutting like a champion, secure and confident that he's a good boy and did the thing. I LOVE IT when Charlie has that feeling about him. But.... Again, like I learned at Plantation, this isn't necessarily realistic every ride. And there are plenty of rides out there when Charlie just kinda.... doesn't wanna, doesn't feel like it, would rather not. And this is where I've had to be careful about my own discipline. At a certain point, I must be objectively clear with Charlie that, "This is your job and you are expected to do it even if you'd rather be at the barn." Luckily, over the course of this summer I've spent a lot of time trying to better understand what approaches will produce both the feeling I want in Charlie and the performance. This past week in particular served as the perfect little case study for how all the pieces work together. Charlie came back into work about a week and a half after his mulch-related abscess. We had a couple quiet and relaxing flat schools asking for nothing more than stretching at the walk and trot, and a little canter. Then a quiet hack, and another flat school - but this time actually asking him to work on the bit. Then a jump school (source of today's pictures) and finally another long 10km hack down to the Gunpowder River. 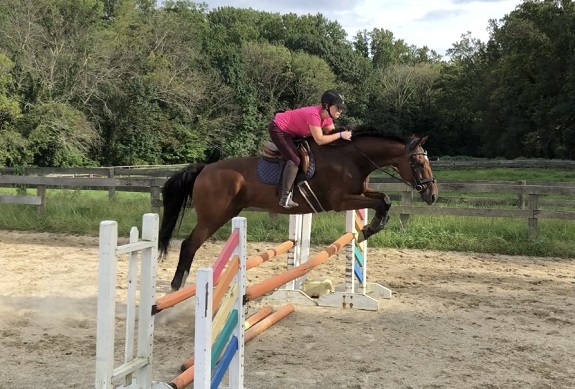 It felt like the perfect balance of rides over a six day period, and the proof was in the pudding with how Charlie came out for his first jump school since the Labor Day weekend hunter pace. I waffled a bit while tacking him up about which bridle to use. Kinda wanted to put the hackamore on, but it's not great for purposeful flat work and I wanted to warm Charlie up as if it were a normal dressage ride. Thought about the elevator since the last time he jumped was while galloping around Tranquility.... but damn I kinda hate dealing with all those straps sometimes haha. Finally I just put on his normal dressage bridle with Myler comfort snaffle bit and figured it would probably be fine. And it was. More and more often it seems like I'm schooling Charlie over fences with this bit, tho I fully expect to continue using the elevator for competitions. True to form for the preceding week, Charlie warmed up very well for the ride. Complete with executing his first ever (!!!!) left lead canter depart from the walk. This is such a big deal to me bc the left lead departs in particular have always been trickier for us. So so so so so SO MANY of our past temper tantrums and "dinosaur-stuck-in-tar-pit" moments were triggered by trying to get the left lead. So the fact that Charlie's beginning to successfully school walk-canter left lead departs is just like... kinda ridiculously exciting to me lol. He's come a long way! Anyway, tho, we started jumping by trotting over a couple plain verticals, then moved on to the first exercise of the day: a looping line of roll backs down the zig zag line, focusing on changing leads over the jump. The track is marked in blue in the earlier diagram, and we rode this from left to right in that diagram. You jump the first then turn left immediately to roll back to the second. Turn right, roll back to the third. Turn left and jump the final. Maybe it's weird to admit, but I've only very very rarely tried to get Charlie to land on any one particular lead or another when we jump. Lead changes aren't really a strength of mine. I tend to be a little uncoordinated, plus I can only really think about so many things at once before other things start to slip. Like if I'm thinking too much about my lead change on approach to a fence, I'm maybe more likely to miss my distance haha. So instead I just school the bejesus out of simple changes (true story: Charlie started practicing simple changes of lead through trot basically as soon as he started cantering under saddle with me), and set the horse up for whatever auto changes they want to volunteer. Luckily, Charlie has pretty baller auto changes in both directions. So often times esp when he's really cruisin along, he'll just change on his own. Otherwise? We do a simple change and move on with our lives. 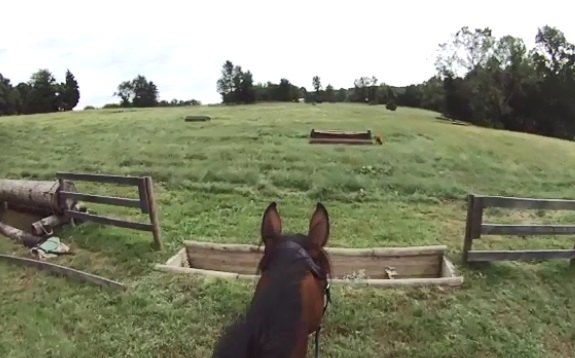 Charlie surprised me tho by executing the lead changes over fences perfectly in this exercise. Good boy! 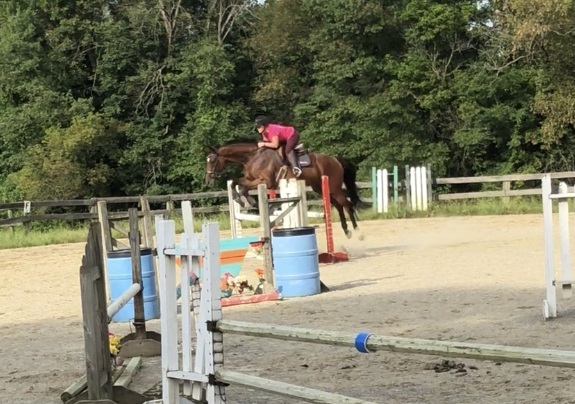 It helped that the jumps themselves were very simple so I could focus almost entirely on positioning for the change (tho, uh, yea this meant that I totally biffed the distance to one of them anyway haha). It didn't translate to our course work tho, mostly bc I stopped thinking about it when we moved on. It's good food for thought, tho, since Charlie's really great at learning things through patterns and repetitions. He likes "games" and "puzzles" (especially when he already knows the answer lol) and the canter is legitimately his strongest, most balanced gait. So maybe it would be worth taking more time to practice landing the lead etc, since he might figure it out pretty quickly. We'll see. Once we moved on to course work, with all the jumps on the smaller side between 2'9-3', Charlie just cruised right on around making quick work of things. 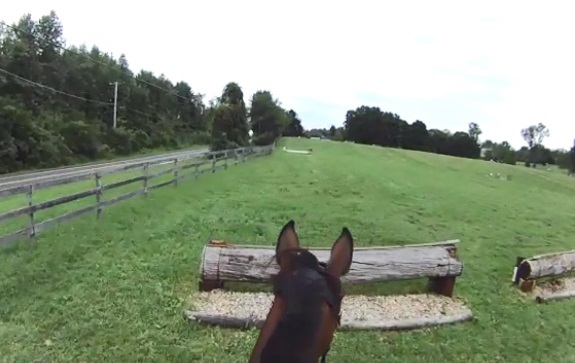 Like I wrote previously, I'm starting to really focus on doing walk-canter transitions to start off each jumping exercise, with the idea being this helps keep the horse in front of my leg. We did so for this ride, and I think it worked really well. 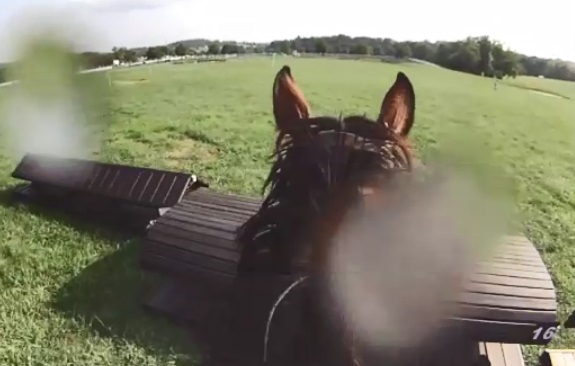 Tho it's interesting watching the video bc the horse isn't exactly under paced, and he did stay in front of my leg.... But there were a couple jumps that would have been improved by taking a more forward stride to them. It's always a tricky balance bc the feeling I'm really aiming for in Charlie's canter right now is all about increased engagement: riding his hind legs further up and under him, with lift and lightness through the front end. We're getting more consistent with this, and it comes hand in hand with increased adjustability - like how easily Charlie cruised back down the same zig zag exercise, but this time in the direct line with 2 strides between each. But as always, there's more work to do. Luckily, working on Charlie's canter is legitimately the most fun thing ever. 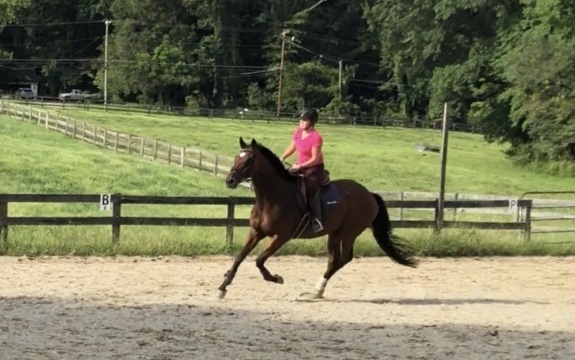 And Charlie's starting to figure out the "game" of counter canter, walk-canter transitions, canter leg yields, and all that good stuff that works directly to produce better and better jumps. Any time the work can feel like a "game" to him, we're that much more likely to finish a ride with him strutting around like a champion. Win win for everyone, right? Do you similarly have exercises you know are good for puffing up your horse's confidence? Or maybe you have to also be careful about slipping in the "hard" stuff between easier work to keep your horse happy and motivated? 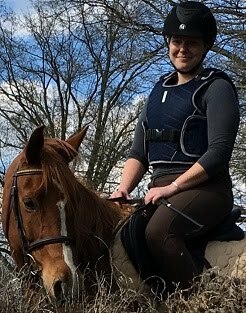 Do you have favorite canter exercises too, or maybe your horse was more like Isabel for me, where the canter was likelier to be a source of frustration? off to the (DIY) races!